The Sun Coast casino is located in the KwaZulu-Natal Province of South Africa. Gamblers can find the casino at the Sun Coast Boulevard, Marine Parade, Durban. The actual geographical positioning of the resort is amazing. It is between palm trees and the beach front of Durban’s Golden Mile. As a result, these add to the beauty of the casino, making for an enjoyable gambling outing. 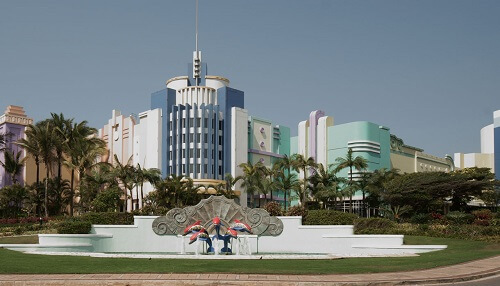 The complex has a Miami Beach Art Deco style architecture. Consequently, this gives the Sun Coast Casino hotel an American look. It’s a real spectacle to behold in the area that is naturally beautiful. The best times to visit this casino resort is in summer. Probably, it will be at its peak during the summer seasons of the year because of the beach and palm trees. As a result, there are a whole lot of summer elements like the beach itself that contribute to the fun atmosphere at the casino. Sun Coast Casino was officially opened in 2002. From that time the casino has managed to gain a lot of popularity. The casino contains 1600 slot machines and there are 67 casino gaming tables. There are a lot of restaurants and food outlets in this complex. Also, it is a very memorable hang out spot especially for those who want quality family get away moments. There is kid’s entertainment area, eight cinemas, Sundeck and Boardwalk, and great accommodation that is offered. Furthermore, this is a Durban tourist attraction as most people like and always wish to visit the Sun Coast Casino and Hotel. The casino has been rewarding lately, making a lot of gamblers go away with smiling faces and fat pockets. Stop missing out on the fun that at the Sun Coast Casino. A Premier Entertainment destination for all gamblers. Read our comprehensive guide on KwaZulu-Natal land-based casinos.